A fully waterproof cover made for all weathers which has an insulating layer that resists the cold to maximise battery life. Our bestselling rain cover. This cover provides a waterproof, protective layer for those times when you have to shoot in the rain or snow. The cover is manufactured with an insulating layer that resists the cold to maximise battery life. The insulating layer provides the additional benefit of reducing shutter noise, essential in wildlife photography. The design features a snug fitting arm sleeve for holding the camera, while a hook and loop type closure allows easy access to camera controls or tripod mounting. A clear window at the rear allows the back of the camera to be viewed, while a flip up panel permits direct access to the camera viewfinder. The lens sleeve is approx 10cm long and features a draw cord at the end for a snug fit around a variety of lenses. 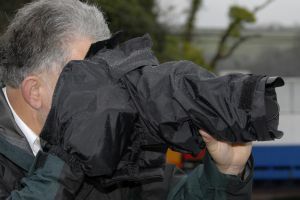 An extension allows lenses up to 40cm long to be covered. When not required, the extension tucks into a storage pocket for convenience.